1 And a reed like a rod was given me as he said: Get up and measure the temple [sanctuary] of God and the altar and those worshiping in it (Revelation 11). 16 Further, he built 20 cubits at the rear sides of the house with boards of cedar, from the floor up to the rafters, and built for it inside the innermost room, the Most Holy. 17 And it was 40 cubits that the house proved to be, that is, the temple in front of it. (1 Kings 6 NWT). 21 and since we have a great priest over the house of God (Hebrews 10). 22 When, though, he was raised up from the dead, his disciples called to mind that he used to say this; and they believed the Scripture and the saying that Jesus said (John 2). 46 Nevertheless, the first is, not that which is spiritual, but that which is physical, afterward that which is spiritual. 47 The first man is out of the earth and made of dust; the second man is out of heaven. 48 As the one made of dust [is], so those made of dust [are] also; and as the heavenly one [is], so those who are heavenly [are] also. 49 And just as we have borne the image of the one made of dust [Adam] [so] we shall bear also the image of the heavenly one (1Corinthians15). So Adam was the first Jesus, looking at the situation from his angle. So if the body of the last Adam is a temple, then so was the body of the first Adam. The first Adam became a living soul sometime around 4027Tishri1 BC. Hence the Tishri1 calendar. Jesus was born on 2Heshvan21 BC because, then he was circumcised on the 8th day which by Hebrew counting is 2Heshvan29, since the first day is 2Heshvan22. Whereas Peter was sanctified on 29Heshvan29 the day of the Jewish call when Jesus was 30 years old by Jewish registration precisely to the day. This was when the water was turned into wine at Cana, symbolising the Jewish call into the 1NC and coincident with that call. That was Jesus' first miracle and you cannot do a miracle unless you are a priest and you could not be a priest under law until you were 30 - which he became on 29Tishri1 by Hebrew reckoning - except that he was non adamic. Now the Jewish call lasted for 30 years precisely from the 30, 60,100 fold in the parable of the sower. But Jesus' actions are all temporally central since the whole plan for man rests upon his shoulders and so he is the fulcrum - see U100. 3 And he said to the man with the withered hand: Get up and come to the centre (to meson) (Mark 3). Jesus positioned himself in ‘the centre’. So he instigated the Jewish call dead centre of the period from his circumcision/registration/naming to the end of that call (the end of Jewish naming into the 1NC, to be the Jewish part of his wife, his flesh, his body). So he was indeed circumcised on 2Heshvan29 and he was born on 2Heshvan21 BC. Daniel12:12 insists that we get a blessing at the end of 1335 days after a day when we started being in expectation. We were in expectation of something from 2008Nisan14. We thought at the time that the Kingdom secular year would combine with the Kingdom sacred year and that both would start on 2008Tishri1, which would be the first day of the Kingdom under this new combined calendar. But that was incorrect and our expectation should be justified. So justified expectation must have started on 2008Tishri2, 2NC first fruits, when the first presence 3rd Holy Spirit was appointed as kingdom priests to both the LWs and Laodicea, the divided sons of the 4EC. Such an appointment could be expected to give us non adamic kingdom bodies. 12 Oh the blessednesses/happinesses of him who is keeping-expectation/waiting and who reaches/touches the 1335 days [one assumes the far end of the 1335 days i.e. day 1335 or day 1336 after 2008Tishri1 or 2008Tishri2, inclusively - since first fruits is always counted as day 1 - of the Kingdom i.e. 2012Sivan16/17. For more see U152] (Daniel12). Satan's lease and the ministry ransom deal were the only two things preventing a son of the ICC from getting the body he is covenanted to receive. For God does not resurrect sons of Adam as non adamics whilst Satan has authority over them. The ministry ransom deal expired on 2014Tishri20, 1266 days of the miracle ministry length after the expiration of Satan's lease on 2011Nisan14 - see U27. So there we were all are bearing the image of the first Adam, worshipping in the temple of his flesh. So let us take the door to the temple as the birth of the flesh of Adam. Then the 20 cubit length of the Holy stands for 4025 years and 6 to 66 days until the curtain which was Jesus' flesh appeared. The 10 cubit length of the Most Holy would therefore stand for 2012½ years and 3 to 33 days from the temple curtain, the birth of Jesus, the beginning of his flesh, until the end of Adam's flesh in some way at its far wall. 4027Tishri2 to 2Heshvan21 is 4025 years and 49 days. Then we add 2012½ years and 24½ days and get 2012Sivan15/16. Furthermore this means that Adam was born on Tishri2, 2NC first fruits day and Jesus was born on Heshvan21 the 2NC Pentecost. That is fitting as the 2NC is for human saints, whereas the 1NC is for angelic saints in the Kingdom. And Adam was the first fruits of mankind whereas Jesus was the first ripe fruits of mankind. So the birthday of Jesus should be a Pentecost with respect to the birthday of Adam. And now it is. It is the 2NC or the human Pentecost. In this way the first first fruits day, Adam's birthday is the last first fruits day, the 2NC first fruits festival. Finally 2012Sivan15 was the Venusian transit day when Venus (the Roman Goddess of Love) became a black ball travelling across the face of the sun from 22:09 on June5 to 04:49 on June6 GMT. So love went right across Jesus' face upon that day, for Jesus said: I am the light of the world, and the light of the world is the Sun. And he is the greater luminary of Genesis1 dominating the day whereas Satan is the lesser luminary dominating the night. Love crossed his face as his true church had their bodies changed so as to be Isaaic non adamic. 2012Sivan15/16, was therefore the day when the sons of the ICC, those in the temple, leave Adam's body and become non adamic. In other words we get the father that we are the sons of. We got a non adamic Abrahamic body on that day and then we got a non adamic Isaaic body on 2013Sivan16. The sons of the CRC then get a reverse ageing Methuselaian body after the ark has come to rest on the mountains of Zoar. Well the ark comes to rest on 2019Tishri17 (the 17th day of the 7th month of the sacred year) on the 2NC mountain of Zoar and again on the autonomous Laodicean/1NC mountain. It is only when the ark is at rest upon both mountains of Zoar, that we can start reverse ageing. The mountains of Ararat are the administrations of curse reversed - Hallelujah Halleluyeshua, Hallelumethuselah, Hallelumelchizedek. The first Jubilee of the sacred ARC Kingdom Sabbath, the 50th month from the first whole month, from 2008Iyyar1, is 2012Sivan. In that month we were released from Adam and became non adamic. a Jubilee releases on the 10th of the month. 2012Sivan10 would have been when the Zoar Passover victims enter the house. We must have entered Zoar on that day as adamic humans and been sacrificed in that house at the Passover on 2012Sivan14. So the Zoar congregation began on 2012Sivan10, the Jubilee release day, the release to Jehovah from Adam. The last day of Zoar entrance is actually 2020Tammuz10, which again is the Passover entry day for the 2020Tammuz14 3rd Abrahamic Passover. (1x+1x.2x ).2x. (5x+1x+1x+1x)+1x = 49x. 49 months. Then he gets a priesthood which gives him access to the tree of life (by putting his hand out to God) on the Jubilee, the 50th month, the release to Jehovah for Adam 3989Sivan, the first Jubilee under Michael's 6,000 year lease from 3993Nisan14 to 2008Nisan14. The Jubilee could also be looked at as a Pentecostal installation period in months. So the sacred working week of Adam ran for 6,000 years from 3989Sivan10 to 2012Sivan14, when we died to Adam and became non adamic - ending that week. On 2012Sivan14-16 both true church, the LWs and Laodicea, became non adamic. So there was no true church of Adam working for God. So the sacred working week of Adam ended. 26 and everyone that is living [not under a death penalty - either in Zoar or a saint] and exercises faith in me will never die at all. Do you believe this? (John 11). So the whole worship system based exclusively upon Adam's flesh lasts for 6037½ years and 73½ days and Jesus flesh appears 2/3rd of the way into that system. This is represented by the ratio of the lengths and actually also the areas of the Holy and the Most Holy in the physical temples. Of course our adamic bodies are our physical temples. So the first men, the LWs, were released from the adamic body on 2012Sivan15/16, 6037½ years and 73½ days after Adam was born and came to be a soul separate from his mother. On 2012Sivan15/16 the first adamic human enters into a non adamic Abrahamic body with an adamic age limit of 240 years rather than 120 years. In other words we start aging at half speed on 2012Sivan15/16. He walks through the end of the Sanctuary wall rather like in the Harry Potter Movies. He leaves his adamic body behind. This being the exact opposite of leaving the Garden of Eden, when Adam and Eve put on ageing flesh, the long garments of skin that Jehovah made for them. Here people shed their ageing Adamic flesh initially in favour of the non adamic ageing flesh of Isaac, the father of the ICC and then later in favour of the non ageing Melchizedaic of Methuselaian flesh. This is the end of Adam's monopoly on human flesh. Melchizedek in Jared was the second Adam. Jesus was the last Adam. In fact Jesus had to come in Edenic (pre fall Adamic) flesh or he would have no place in the Sanctuary! Gabriel (who possessed Methuselah) and Melchizedek (who started life as Jared) are also in the Sanctuary. They are the two Cherubs guarding the ark. On 2008Shebat2 (2009Feb2-3 from tote.doc) Emmanuel contacted Mike and told him that the ratio of the Holy to the most Holy of 2:1 was the ratio from Adam to Jesus and then from Jesus to the end of Adam. Mike told Gordon. Gordon and Mike immediately accepted this brilliant interpretation. Gordon then changed his date for the end to be 2012Heshvan27, the end of a greater flood beginning on 2011Heshvan17. Our first attempt at the end of the temple ratio prophecy was 2012Nisan10. The prophecy ran from 4027Tishri10 (Adam's supposed birth) - 2Tishri10 (Jesus' supposed birth) - 2012Nisan10 (when we thought we would go into the ark). Here is our attempt at the timetable of the end as of 2009May26. The Dates in 2008 are according to the ABLC which is one month retarded with respect to the BLC. So 2008Shebat2 (ABLC) is 2008Adar2 (BLC). We no longer use the ABLC (Abib Biblical Lunar Calendar). 2008Nisan14 (March21)	The end of Satan’s 6,000 year lease. The world ends judicially. 2008Nisan16 (March23)	Angelic loss day. Satan is abyssed in Gehenna. 2008Nisan17 (March24)	The Kingdom of God starts judicially. 2008Tishri1 (October4-5)	The first day of the year under the New Kingdom Calendar. 2008Chislev6 (December8/9) Pentecost 2008 Kingdom BLC (Tishri1 start). 2008Chislev7 (December9/10)	Jubilee Release day. 10th hour of 7th day of 100th month of LWs.Mina, Mina, (50, 50) fulfilled. 50, 50 man in cave fulfilled. 2nd Pentecost in 2008, 2nd Jubilee release day of the LWs. 2008Shebat24 (2009February24-25) 1600 days of Revelation14:20 end. 1000 days of Daniel5 end. Watchtower loses control of congregations. 2008Adar13 (2009March15/16) Evil Slave is cut in two. 1335 days of Daniel12 begin. 2009Nisan14 (April9/10) Passover according BLC calendar (Nisan1 start). 2009Iyyar29-Sivan5 (May24-31) 7th week of Pentecost. Violent explosion, terror attack in Manhattan. Acts 2:2 fulfilled. Mushroom cloud of 1Kings18. 2009Heshvan15-28 (May10-23)	Hezekiah’s Late Great cakes and 2nd cakes under Tishri1 calendar. 2009Ab29-Elul5 (August22-30) End of 90 days of cloud rising in West to South Wind. Last 1NC reserve saint from Watchtower comes into LWs. 2011Heshvan17 (November16/17) Greater flood of Noah begins. 2012Iyyar27 (May18/19) Rapture begins, half way through overthrow of cities. 2012Tishri10 (September28/29)	Entrance into Zoar ends. 300 day for cubit length of ark ends. Everyone not in Zoar by now will die in the next 46 days. 2012Tishri17 (October5/6)	40 day lava flood of extinction level volcanic event starts. Preaching ends. Final 31 day rapture period starts. 2012Heshvan18 (November5/6) Rapture from Zoar ends. 2012Heshvan26 (November13/14) Total Solar Eclipse on last whole day of adamic mankind. 2012Heshvan27 (November14/15) 40 day lava flood ends. All non raptured humans dead. End of greater flood of Noah. 1335 days end. " We thought at the time that the Kingdom required a new calendar since leaving Egypt required one and we thought that the new Kingdom calendar united both the sacred and the secular year to begin on 2008Tishri1 So we were in expectation of some manifestation of the kingdom from 2008Tishri1 (one could argue - in fact we were in expectation from 2008Nisan14). Then 1335 days later is 2012Sivan16, the end of the temple ratio prophecy, Zoar 2NC first fruits. Certainly 2008Tishri1 began the first whole year of the Kingdom of God. And I saw the Messiah, the son of David, and his generation, and all the battles and wars and all that they will do to Israel whether for God or Bad. And all the rest of the leaders of every generation and every deed of every generation both of Israel and of the Gentiles, whether done or to be done in the time to come to all generations, till the end of time [for the Adamic system, the world], were all printed on the curtain of the omnipresent one (3 Enoch). So 3 Enoch informs us that the heavenly curtain of Jehovah displays the entire activities of the world of Adamic man from the beginning until the end. Whereas the Temple Ratio Prophecy asserts that the position of the earthly curtain gives us the chronology of all the activities of the world of Adamic man from the beginning to the end. It tells us that they run from 4027Tishri2 to 2012Sivan15/16. The heavenly curtain gives you the heavenly picture, all the deeds for judgement, and the earthly curtain gives you the earthly picture, the chronology, of the world of Adamic man. Perhaps the position of the washing basin represents the time of the first baptism of a pre-adamic human. The altar of sacrifice is the 1NC reserves, for they are baptised into the sacrificial death of the Christ. The only living being that gets sacrificed in a Christian church is Jesus (either himself or through the flesh of his wife). We know that there are 6,000 1NC reserves left . So that is the measure of the altar. Which is very interesting because that is precisely the length of Satan's lease in years. So we have a bride for a year here! 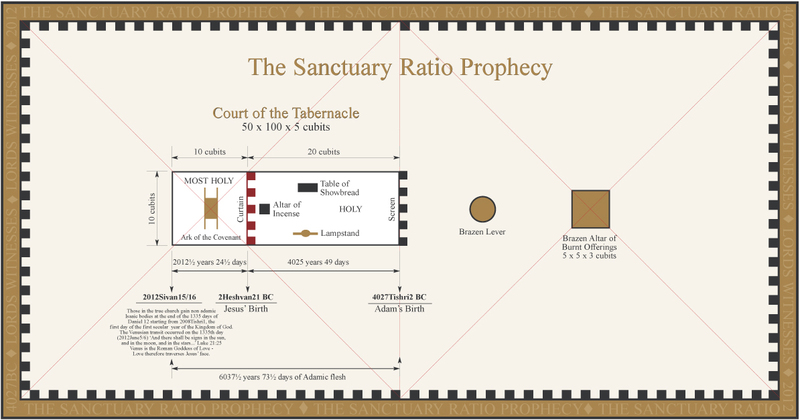 The temple ratio prophecy runs from 4027Tishri2 to 2012Sivan15/16 which is 6037 years and 253½ days. Those worshipping in the altar are those worshipping in Jesus - which is all of those in the true church with a valid water baptism - I think. That will be 10% of mankind God's percentage. So that is presently 350 million. That is the measure of them. Since the dimensions of the sanctuary are critically important to man's chronology, we must infer that the dimensions of the courtyard have a similar import. If the sanctuary is Adam, then the courtyard must be mankind. There was no distinction between Adamic and pre adamic man before the sanctuary and neither will there be such after the sanctuary. This means that ex-adamic man will be united with adamic man after the end of the time of the end. Also pre-adamic man existed in parallel with us during some of the 6,037 years and 253½ days of fallen adamic man, hence the width of the courtyard. We must exist as humans for 4025 years and 49 days after we escape from Adam's flesh. So the last human gets the capability to become an angel in 6037 AD. We will of course keep our right to be human, and one can imagine angels going on human themed package holidays for a few years every now and then. This one was twice as large as the Tabernacle in its dimensions. This may represent that it functioned for a period twice as long as the Tabernacle. The Tabernacle was inaugurated in 1512Nisan. Solomon's temple was inaugurated in 1026Tishri and Zerubabbel's temple (a rebuild of Solomon's) ceased being operational on 33Nisan. So the Tabernacle was the temple for 486½ years and the double size temple had a gross period of operation from 1026Tishri to 33Nisan which is 1057½ years. But there was a gap of 70 years and 8 months between 586Ab10 when Nebuchadnezzar burnt down the Solomon's temple and 515Nisan when Zerubbabel's temple was inaugurated. There was a gap of perhaps 2300 days plus 1080 days during the persecution of Antiochus Epiphanes from when he, a Gentile, appointed Jason as the high priest (with a bribe) on 174Elul1 (calculated - may be wrong) to 165Chislev25 when the temple was rededicated. So the double sized temple was operational for around 977 years. So perhaps the net period of operation was 2x 69½ weeks of years or 973 years? The sanctuary of the Tabernacle was 10 cubits by 10 cubits. The Sanctuaries of Solomon's and Zerubbabel's temples were 20 cubits by 20 cubits. So the area ratios for all 3 temples of the law were 1:4:4. Now Jesus was the foundation stone of the Christian temple so we take Solomon's temple, which was a stone building to be the first presence and Zerubbabel's to be the second presence and the tabernacle to be the temple of the entire Law of Moses. Then we see that the ratio of physical Jews who have been under the law of Moses to the rest of the 1NC saints in the two presences is 1:8. So there are 16,000 Jews who have been under law among the 144,000 1NC saints. There are of course other Jews who have not been under law amongst the 1NC saints. Since the Jews came into the 1NC first they will be dominating it, because God is patriarchal. This is why Isaac (meaning Isaac and his seed) loved Esau (the 1NC saints) because of game/hunted ones/evangelisees in his mouth, i.e. hanging on his command. The firstborn son inherited a double portion (two parts) of the property as compared with that allotted to other sons. So it is a well founded fact that the father with 2 sons divided everything into 3 parts, giving 2 thirds to the son with the firstborn rights. We do also understand that God uses the spatial to symbolize or prophesy the temporal. Now I wondered if this rule for the legacy too has a prophetic and chronological application. An application reflected in types and antitypes in the lives of the main patriarchs. A simple start to try out this concept was Abraham. We know from the “midst prophecy” that Jesus died in the centre of the Abrahamic Covenant, the salvation covenant for all those with faith who obey their conscience. Bible chronology shows that Abraham crossed the Euphrates as instructed by Jehovah in Nisan 1943 BC. The whole Abrahamic Covenant lasts 3950 years until 2008AD, 6000 years after Adam’s sin in 3993BC. Jesus died dead centre in this covenant in 33AD, 1975 years after the inauguration of the covenant and 1975 years before entrance into that covenant ends (2008AD). So I tried to apply the principle of “2:1” to these 3950 years. 3950 / 3 = 1316.66 This is 1 third. 1316.66 * 2 = 2633.33 This is 2 thirds. We know that 2008 is the year of the end of entrance into the Abrahamic Covenant. But what about the year 691AD? The sons of Ishmael, the Moslems, completed the “Dome of Rock” on the Temple Mount in Jerusalem!!! So for 2 thirds of the time of their father’s covenant, the offspring of Isaac was the dominant seed, but in this year, this landmark made it clear who was to dominate for the remainder of the covenant period. Well, I thought what applies to Abraham must also apply to Isaac. The trick is to find the correct start date for the type and the correct end date of the antitype. The most remarkable event in Isaac’s life surely was when he agreed to be sacrificed to Jehovah by his father. Again, we understand from biblical patterns, that Isaac was 33½ years old when this happened. He reached that age in 1885 BC. Obviously, the antitype he was proclaiming is Jesus’ ransom death in 33AD. So the period between the 2 events is 1917 years long. 1917 / 3 = 639 this is 1 third. 639 * 2 = 1278 this is 2 thirds. Bingo! Jesus’ death and the start of the Gentile Times! In this year, Pharaoh Necho established Jehoiakim as vassal king over the offspring of Abraham through Isaac! I have to do more studying on Jacob yet how this principle does apply to him.